Been there. It's a lot of work. Good luck. We need to have a garage sale soon...but I'm dreading THIS! However it might become necessary as my boyfriend and I combine our households. I'd say try Craigslist, but I am so uncomfy with people coming over to my house like that. Oh my...good luck with the rest of it! Wanna come do my garage sale for me? Were moving soon & I really gotta get rid of 1/2 our junk! It looks like you have a lot of stuff to sell. Good luck! Hope it's worth your work and mess. I know the feeling. I've decieded it's easier for me to consign my stuff and I make better money. they sure are a ton a work huh!! hopefully it will pay off!! this is the season! Wow! You got rid of almost half your bins. That's amazing. My house looks like that as I am gearing up for mine. It seems like the best part of the yard sale is when it's over! 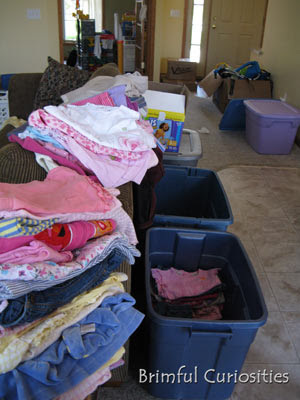 We usually just donate the left over, it feels good to have things cleaned out! How many did you start out with? That is a lot of clothes!